The 27th edition of the Salon International de la Haute Horlogerie (SIHH) saw significant changes this year with an expanded exhibition and an open day where. For the first time ever, the public was invited to walk the aisles of this historically trade-only expo held at the Palexpo convention center in Geneva, Switzerland. One of the standouts at the event was Cartier, which has revived for 2017 its celebrated Panthere de Cartier watch collection for women. An icon of the 1980s, exemplifying the “decadence of the decade”. The Panthere de Cartier collection gained cult status three decades ago by positioning the ladies watch into a piece of jewelry as much as a timepiece. To understand the origins of the Panthere de Cartier collection, however, one has to look further back to the beginning of the twentieth century when the panther first became the brand’s animal muse. Louis-Francois Cartier may have founded Cartier in 1847, but it was undoubtedly his grandson, Louis Cartier, who would go on to establish the name as a world-renowned brand and luxury industry pioneer. In 1914, Louis Cartier commissioned a watercolor painting by the French artist George Barbier. Entitled “Dame à la Panthere” this work of art, featuring a woman draped in jewels and a panther with a diamond-encrusted collar at her feet, would align the brand with the symbol of this elegant cat. Later that year, Cartier released its first product featuring the panther. After developing a unique technique for setting stones using wires made out of precious metals, Cartier unveiled its Art Deco Panther wristwatch. The design features platinum, rose-cut diamonds, and spots in black onyx, was meant to imitate the panther’s fur coat. For the next few decades, Cartier would go on to use the panther as a muse for its jewelry creations and the big cat would feature often across the brand’s advertising campaigns. An exotic animal embodying beauty, femininity, power, and elegance, it’s not hard to see why. Then in the eighties, when extravagance and indulgence were at their peak, Cartier released the Panthere de Cartier watch collection, centering their timepieces once again on the wild cat. A series that would be in production through to the early 2000s, these timepieces gained such prominence that today they are instantly recognizable as Cartier. With its square case and link bracelet, the Panthere quickly joined the ranks of the Maison’s other iconic timepieces such as the Cartier Santos and the Cartier Pasha. 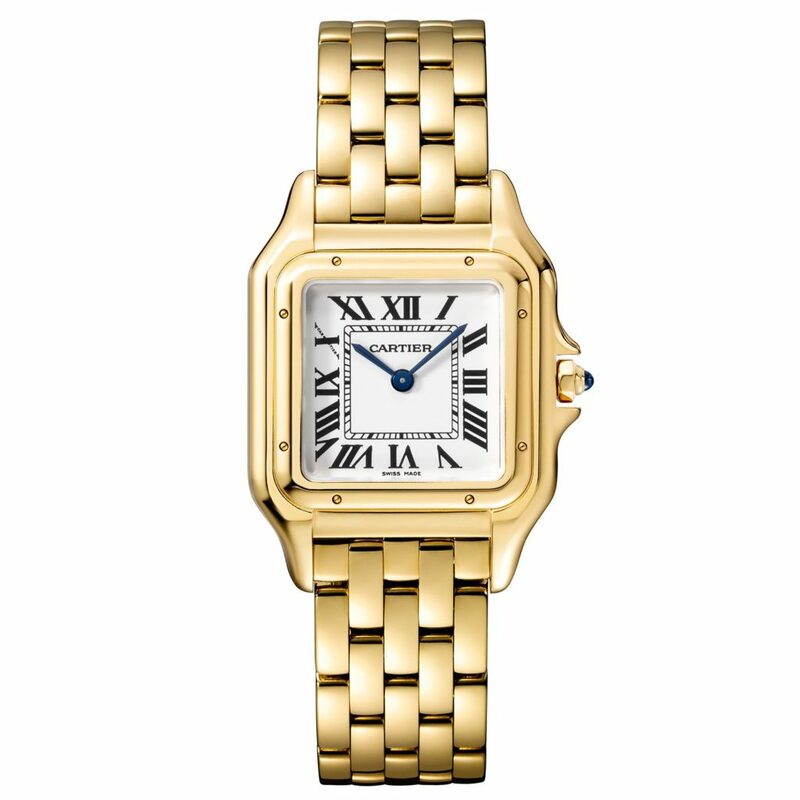 Although the Panthere de Cartier was eventually discontinued, it remains as one of the brand’s most popular ladies’ watches—a testament to Cartier’s enduring aesthetics. In fact, at Gray & Sons we carry a wide range of vintage and discontinued Panthere de Cartier for sale including all stainless steel and 18k, and all 18k in 3 sizes and gold Cartier watches. For 2017, Cartier has brought back the Panthere de Cartier watch collection in full force. Reminiscent of the 1980s timepieces, but with an edgier look than before, the current series comes in two sizes. Small, measuring 22 mm and medium, measuring 27 mm in diameter — and boasts nine metals and/or finishes, better resistance to water, and stronger link bracelets. The collection features the original line’s beloved square case with visible screws on the bezel and brick-lay chain-link bracelet straps with integrated lugs and concealed folding clasps. Famously trumping mechanical advances with a focus on appearance, all Panthere de Cartier models are powered by a quartz movement. 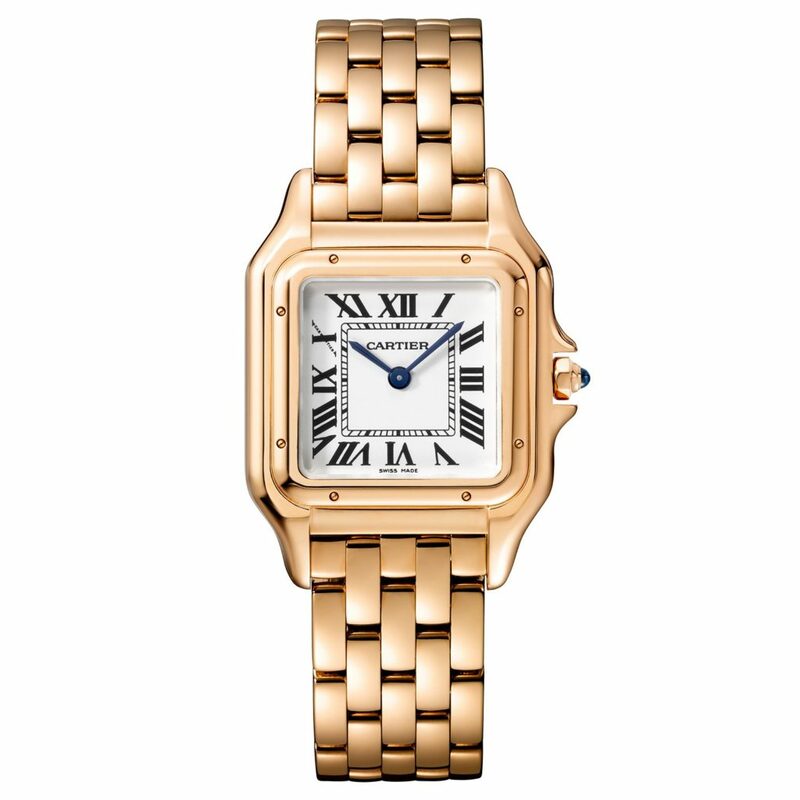 Gleaming statement pieces that Cartier has called a celebration of triumphant and carefree femininity, these watches have been made to complement any outfit and be worn effortlessly from day to night. As such the Panthere de Cartier models are available in steel, yellow gold, pink gold, pink gold with a paved diamond bezel, white gold with a paved diamond bezel, white gold fully paved with brilliant-cut diamonds, white gold fully paved with brilliant-cut diamonds. As well as panther spots in black lacquer, and a two-tone version with steel and yellow gold, as well as a limited edition piece in pink gold with a dial and links featuring black lacquer. Made for all women of impeccable taste, this collection includes an array of price points from the more affordable to the particularly costly depending on the metal used and additional embellishments. 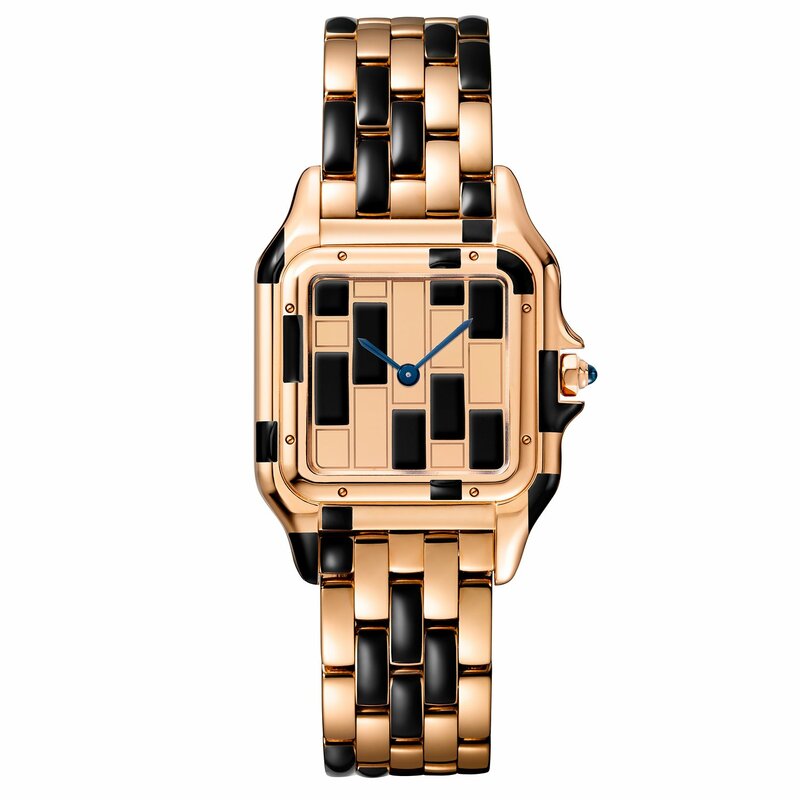 Epitomizing the ladies watch of the 1980s, we have no doubt that the updated Panthere de Cartier line will go on to define women’s luxury watch trends in 2017 and the years to come. We have been in business since 1980 in beautiful Miami Beach, Florida. The principal focus of our company has always been selling meticulously restored & mint condition Certified Preowned watches and one-of-a-kind estate jewelry pieces. Our Miami Beach showroom is located across from the world renowned Bal Harbour Shops, and we have been doing mail order business with customers around the country (and around the world) for over 13 years. If you are ever in the area please stop by, we would love to meet you. 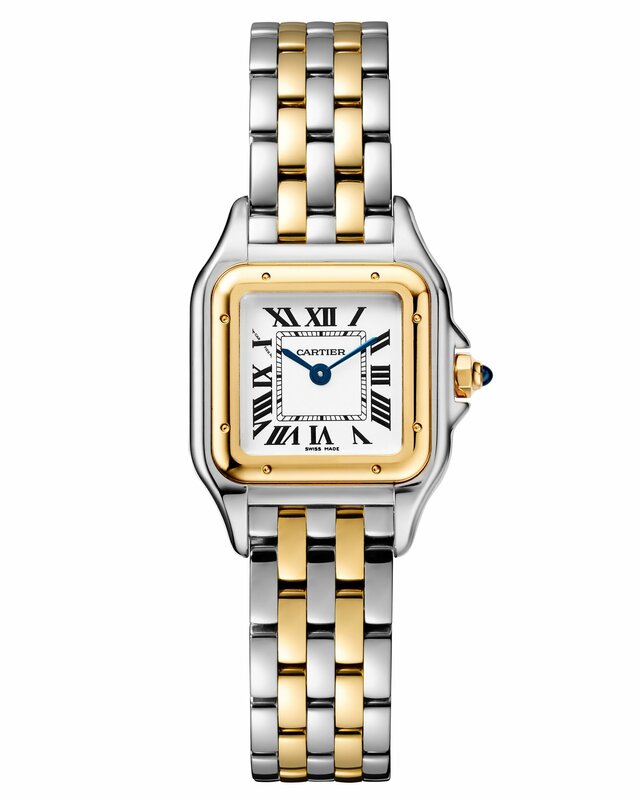 I would like a price on the new 2017 Cartier ladies large stainless and gold Panther .